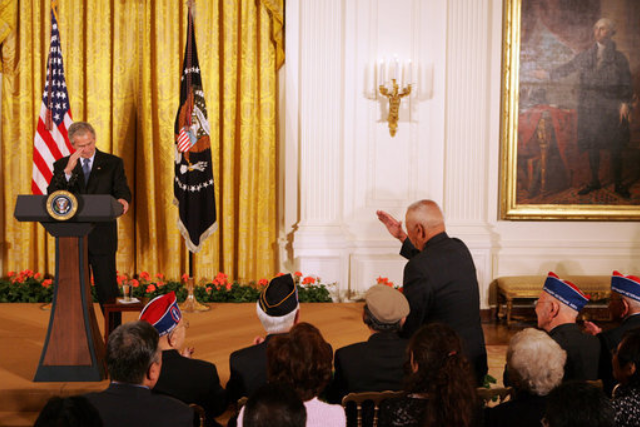 President George Bush returning Ben Kuroki’s salute on May 1, 2008 in the East Room of the White House. When the President extolled Kuroki’s patriotism and heroism in aerial combat in Europe and the Pacific, Kuroki stood and offered his hand salute. Kuroki, 442nd and MIS veterans, seated front row and center, were invited as special guests. The President also recognized the 442nd and MIS veterans for their courage in combat in Europe and the Pacific, respectively. The occasion was the celebration of Asia Pacific Americans Heritage Month. White House photo.